The sixth Milling Wheat Challenge competition was launched on the 12th January with a closing date of 1st May. The Challenge is open to all UK farmers growing bread-making (Group 1 & 2) wheat. The aim of the competition is to find the UK’s outstanding growers of quality milling wheat and to identify those who have a good understanding of their end market, their business costs and an ability to reflect both in their marketing of milling wheat. The competition has become established as a way for Britain’s flour millers to formally recognise the value of the country’s best growers to the processing trade. Millers are committed to working with UK wheat growers and the Challenge aims to identify farmers who combine attention to detail with end-customer awareness and business acumen to create a win: win for the whole wheat chain. Entry forms are available via the nabim and HGCA websites. The three finalists will be announced at the Cereals Event on 10th June. On-farm judging of the finalists will take place in late June. The competition judges are Martin Savage from nabim, Richard Laverick from HGCA and Lincolnshire Farmer Mark Ireland. IDMA 2015 – preview video! IDMA is the biggest meeting platform and 6th in its history for international flour, semolina, rice, corn, bulghur and feed milling machinery and also incorporating pulse, pasta, biscuit technologies in one exhibition from April 23-26, 2015, 10am to 7pm each day. Maize is a staple food in many parts of sub-Saharan Africa, including Zambia, which produced about 3.4 million tonnes of the crop in 2014. It is widely used to make mealie-meal – finely ground maize made into flour – that consumers depend on for an array of traditional dishes. For a variety of production-related reasons – including the cost of milling and transportation – mealie-meal prices are volatile, making it unaffordable for consumers in much of the country. To address this, the Zambian government is encouraging smaller, more localized mills to improve food security by reducing the cost of food. 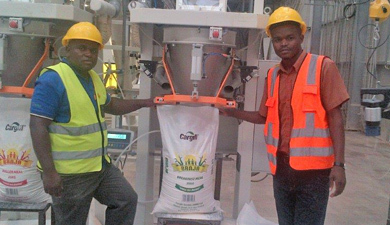 Cargill has responded to this need with the launch of the first commercial maize mini mill in the Eastern Province of Zambia. Located in the capital city of Chipata, this accessible mill will provide local rural and urban farmers with a reliable, consistent market for their maize, as well as produce competitively priced mealie-meal for consumers. According to van Zyl, the mill will produce high quality white and roller maize meal for the domestic market, including Cargill’s in-house brand that will be available in 5kg, 10kg and 25kg bags. The U.S. $2 million high technology mini mill has a milling capacity of 2mt/hour, and offers a distinct advantage in the maize meal market in Chipata and the surrounding areas. “As the mill will source local maize and produce mealie-meal right in in Chipata, transport and fuel costs will be reduced and Cargill will be able to offer a competitively priced product,” said van Zyl. Over the next few years, Cargill plans to build additional mini mills in other rural locations in Eastern and Muchinga provinces. 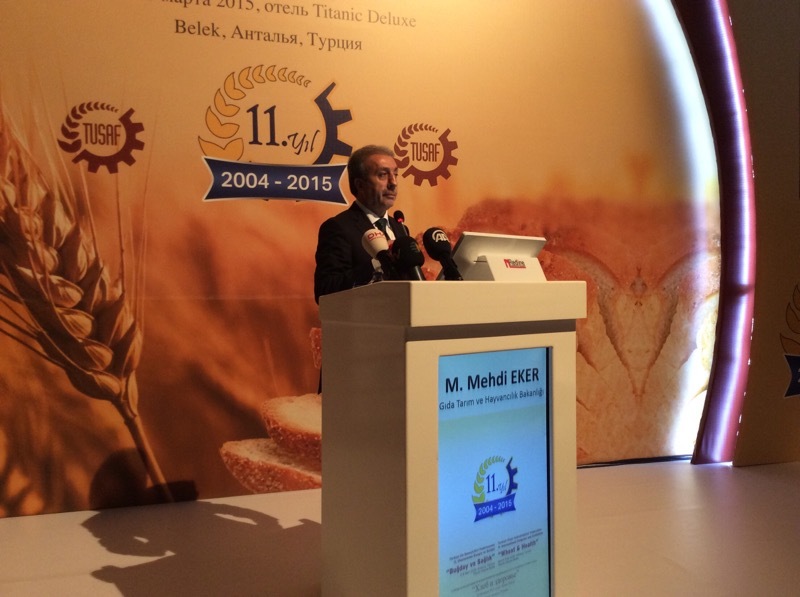 Mr Mehdi Eker – Government Minister, Ministry of Food, Agriculture and Livestock, took to the podium earlier this morning and reiterated the importance of Wheat and Health, emphasising to all the extreme importance of this topic. Raising once again the topic of not eating any white foods, Mr Eker went on to explain that we have been consuming bread as a product for over 1,000 years, and surely this should have been enough time to have identified if this product should be consumed by humans. Quite the contrary, it has been a stable food of our ancestors and they have all been very healthy. Mr Eker also continued that Anatolia or Asia Minor as it was known is one of, if not, the richest places on the earth. having over 4,200 plants and species under protection. For 1000s of years humans have farmed this land for wheat for human consumption. He continued with it therefore being logical to assume that in this case the wheat and various plant variants will have been cultivated and will have entered our genes, and our genes must have over 1000s of years become accustomed to them. We must remember that Anatolia is the birthplace of wheat and over many years has spread all over the world and in regions like the Americas and Europe it is a basic staple food for millions. There are of course other basic staple foods in other regions which have a different typography or weather system such as rice and maize, however it is well know that if these three; wheat has a much, much higher nutritional value. Globally, people not only eat the basic food stuffs, they also eat food prepared by others and processed foods. 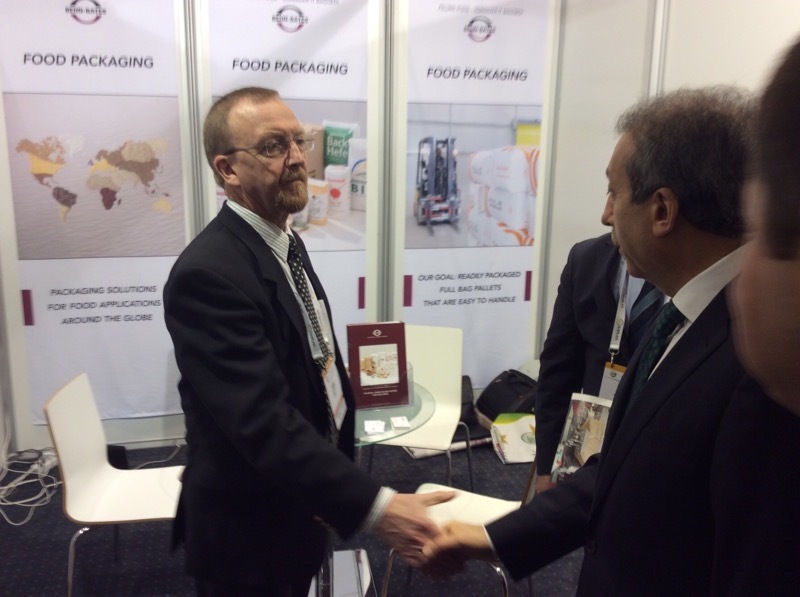 Any new foods produced today are taken to the global market very quickly with advertising and good logistics, this is why we have seen an increase in refined foods being consumed. What is critical, is we need to synthesise the knowledge at hand with wisdom – if not we will have knowledge pollution, and what we eat will become a burden. Mr Eker continued, campaigns against specific food stuffs is not wise. In reality we each need different food categories to a certain amount for a balanced diet. Important of course is the amount of each food stuff you consume. When margarine came to the market, we were warned off butter, when vegetable and sunflower oil entered the market we were warned against olive oil the same happened with eggs which much mud slinging. We must be careful of the negative campaigns, there is nothing wrong with white bread, butter and olive oil, everything in moderation is good. If you are ill, go to the doctor for a prescription – do not just stop eating a specific food type. 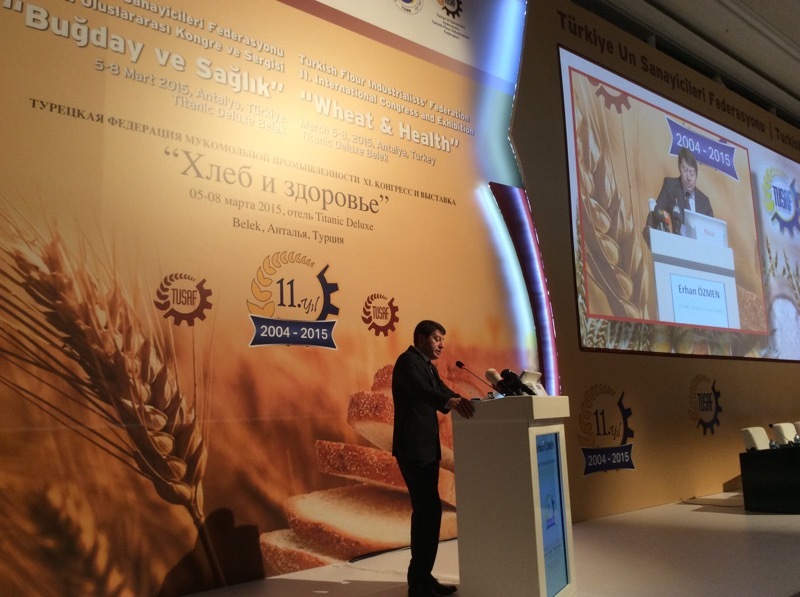 Mr Eker went on to talk about the wheat and flour industry, pointing out that Turkey is now either number 1 or 2 in the world for wheat exports, and in 2002 they were significantly lower. He was keen to point out that this needs and deserves attention. From 2003 to 2013 Turkey saw huge growth, not only did they grow more, more was processed and significantly more exported being the surplus. In addition to this Turkey imported over 40 million tons of grain worth over $16.5 million, after it was then processed and exported. In 2005, Turkey was the 11th largest global exporter of wheat/flour with $353,000 tons worth around 48,000. In 2014 this was 2.2 million tons worth $993 million dollars (almost $1 billion). 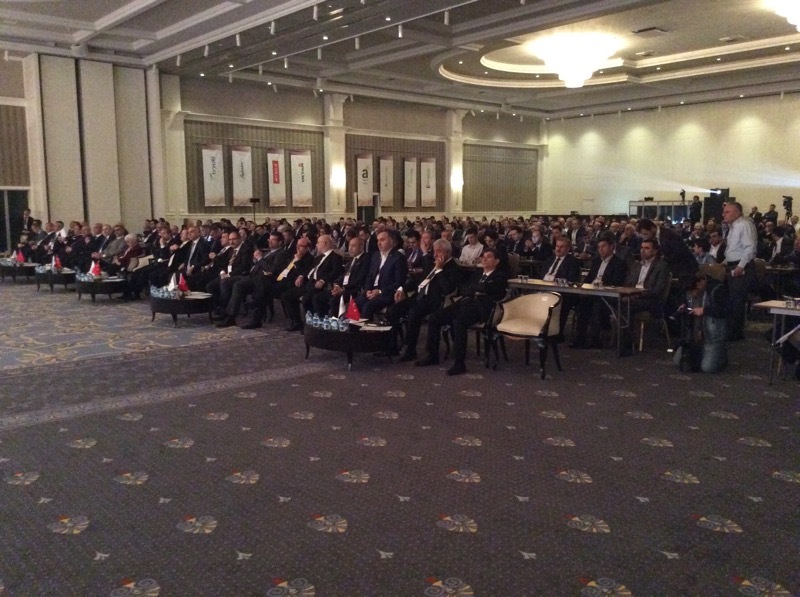 Mr Ekin announced, we must target 1 billion and exceed this milestone. We are the leaders around the world, I am proud to announce this at such an international conference. On top of this, our pasta exports have gone up 30 fold, in 2002 we were the 7th largest and in 2013th we were the 2nd largest exporter of pasta, 2014 figures are not in yet but I suspect we will either hold our position at second or jump to number one. 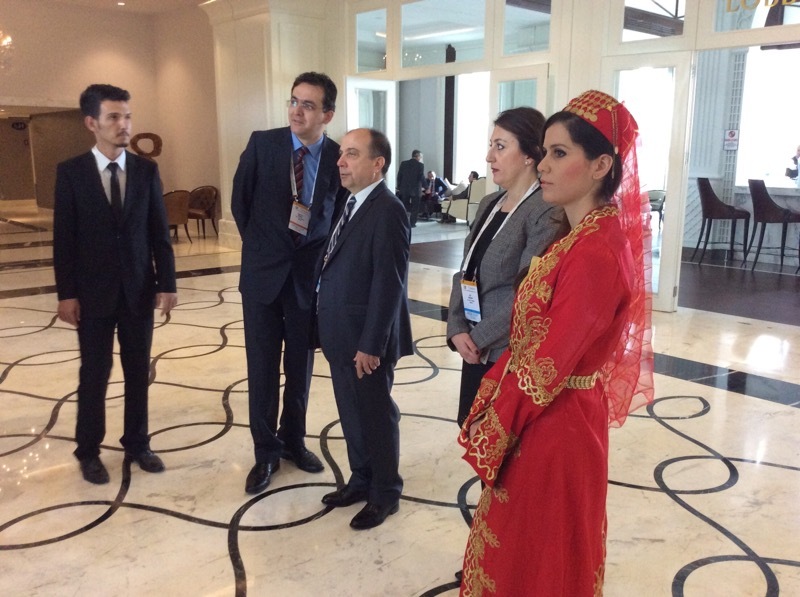 Mr Eker explained a few statistics, 54% of all registered farmers in Turkey are producing wheat with more than 1 million people employed. 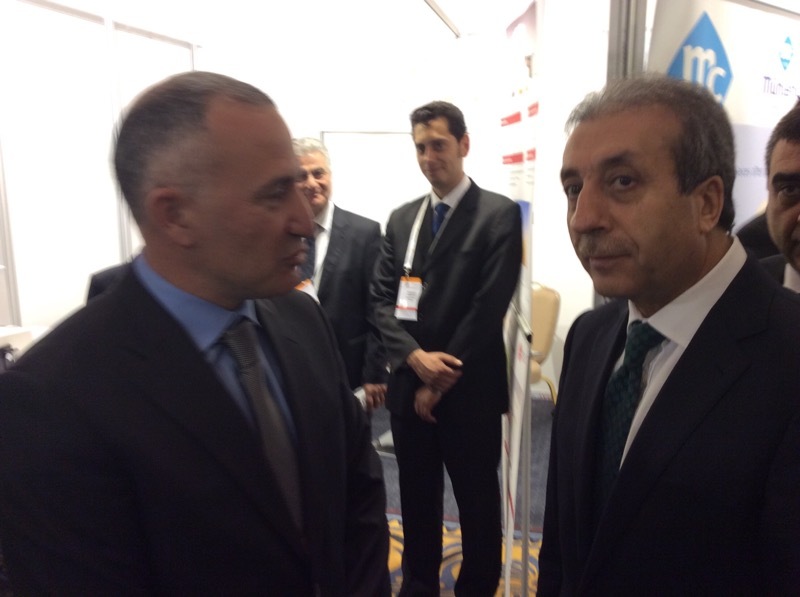 He was proud to point out the Turkish governments involvement in certifying seeds, some of which are developed by government agencies and some in the private sector. 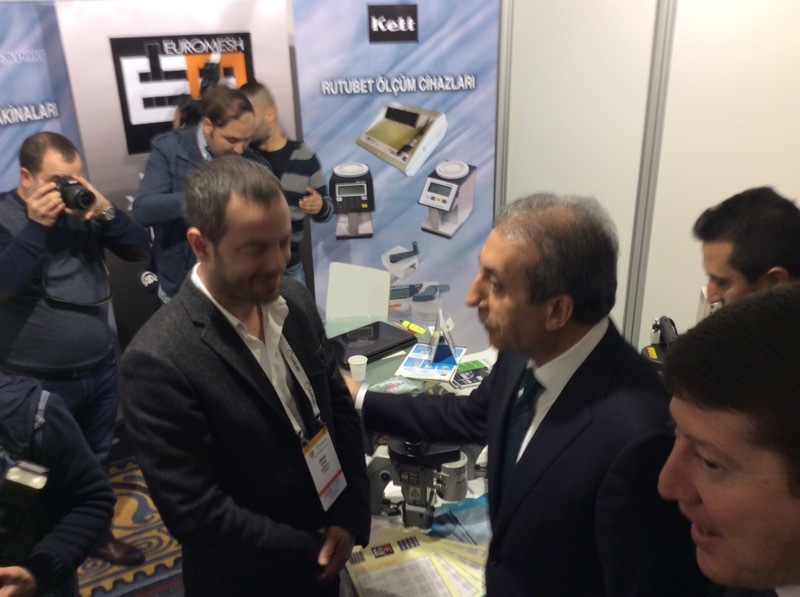 Mr Eker also reminded everyone that the Turkish Government is meeting 22% of all the wheat production cost, through such areas and soil analysis for farmers. Explains that they are behind 464 projects where they have spent over 100,000,000 Turkish lira of which 213 of these projects are directly related to Wheat processing. 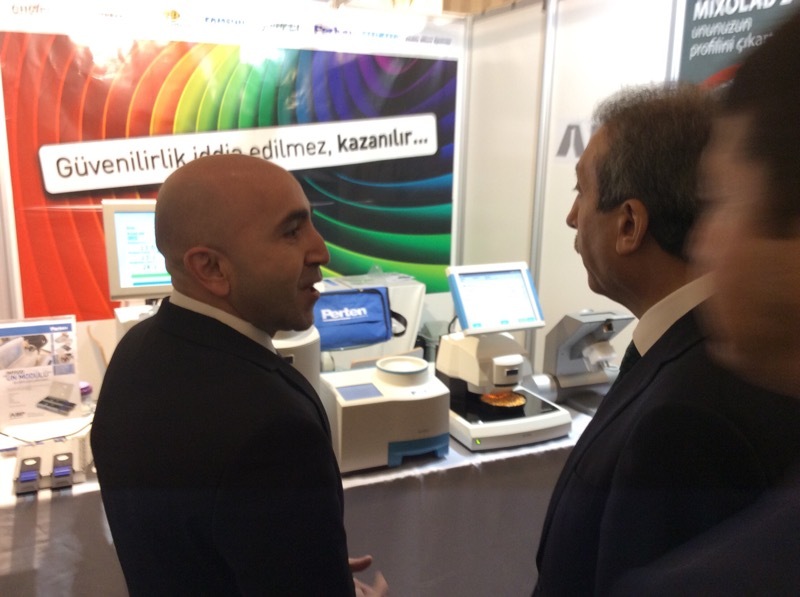 And for the future they are protecting seeds and genes in Ankara, where they have the worlds 3rd largest gene bank. Alongside which they have opened anew biological centre where they can study new seeds and where it used to take 10 to 12 years to bring a new seed to market, they will now be able to do it in 7 years. 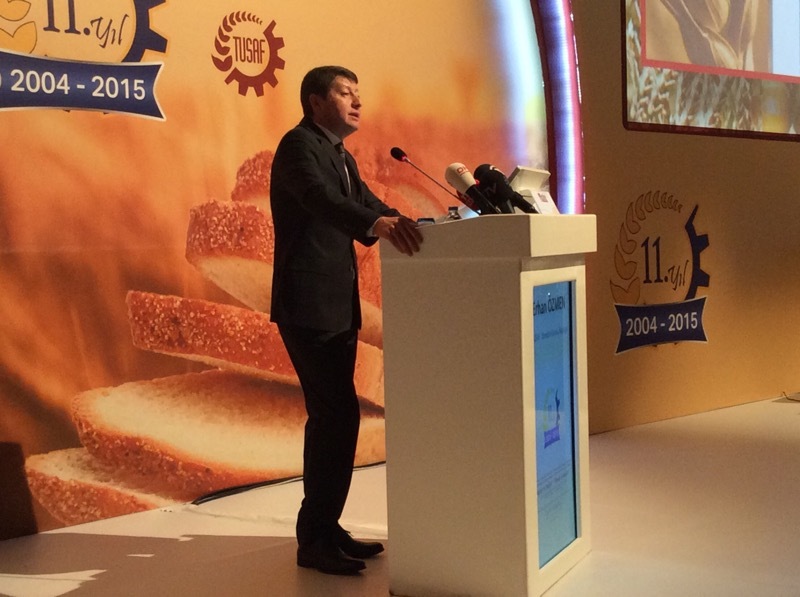 Chairman of TUSAF, Mr Erhan Ozmen once again opened the 11th TUSAF (Turkish Flour Industry Federation) Congress this morning. a) a man is successful until he fails. He went on to say, that this is changing and must change faster, it is the women who care for and nurture our young with love and affection just like Mother Earth who has supplied us with wheat which we have been consuming for 1000s of years. Mr Ozmen continued to talk about the continued momentous growth in wheat yields and the growth in exports and finished of with a reminder to continue the combat against diminishing the importance of bread. His final words were, “We hope the conference will benefit all humanity”. Flour Mills of Nigeria (FMN) Plc is one of the leading companies listed on the Nigerian Stock Exchange (NSE) and the clear leader among the flour milling industry. In the food products subsector where FMN is listed, it is the highest priced at N34.50 at the end of February. The closest to it is Northern Nigerian Flour Mills, which closed at N18.05. The other two flour milling firms, Dangote Flour Mills and Honeywell Flour Mills closed at N3.53 and N2.98 respectively. Although the three stocks are trading below their 2015 opening values, FMN has a better performance so far as it closed at the end of February with a decline of 11.9 per cent. Dangote Flour Mills shed 22 per cent, while Honeywell Flour recorded a decline of 14 per cent. Despite the better market statistics of FMN, the shareholders of the company have every cause to worry given the company’s nine months results ended December 31, 2014. Its net profit dipped by about 44 per cent in 2014 compared to corresponding period of 2013. Established in September 1960 as a private limited liability company, FMN commenced operations in 1962 with an installed capacity of 600 metric tons per day. It became a public limited liability company in 1978 and got listed on NSE. Flour Mills has a mill located in Apapa, Lagos which comprises 10 integrated mills. The company’s shares are 51.5 per cent held by Excelsior Shipping Company Limited, while the balance of 48.5 is held by other shareholders. The board of directors of FMN is led by Mr. John G. Coumantaros as chairman and Mr. George S. Coumantaros, who is the founder as chairman emeritus. Mr. Paul Gbedebo is the group managing director/CEO. Other directors are: Alhaji Abdullah A. Abba; Chief James O. Fagbemi; Prof. J. Gana; Alhaji Rabiu M. Gwarzo; Mr. John Katsaounis; Mr. Thanassis Mazarakis; Mr. Atedo N.A Peterside; Mr. F. O. Philips; Alhaji Y. Olalekan A. Saliu; Mr. Folarin R. A Williams Jnr. FMN ended the nine months with revenue of N244 billion in 2014, up from N240 billion in 2013. Cost of sales went up from N215 billion to N222 billion, while gross profit fell from N24.3 billion to N22.3 billion. Although other operating income grew from N2.7 billion to N4.8 billion, that growth was moderated by a similarly increase in selling and distribution expenses from N3.5 billion to N4.6 billion. Consequently, operating profit fell from N14.75 billion to N14.32 billion. Investment income fell from N4 billion to N3.4 billion. However, finance income rose from N10.5 billion to N15.3 billion. Despite reducing income tax from N2.418 billion to N401 million, FMN ended the year the period with a lower profit of N3.29 billion, down from N5.9 billion in 2013. Assessing the results of FMN, analysts at Dunn Loren Merrifield said the revenue growth is not in line with demand for flour and associated products. According to them, the sustained demand for flour-based products, given their increasing use in staple foods –supported by the increasing consumption of the nation’s youthful population. “In addition, the fact is that there was no major price increases to induce a slowdown in demand for its products during the period. Given this, in our view, FMN was unable to take advantage of the demand as the firm’s market share appeared to gradually wane given the growing competition in the market – on the back of increased flour supply in Nigeria’s flour market. This may have limited FMN’s ability to drive volumes and influence prices that would have impacted revenue growth,” they said. The analysts, however, said they maintained a positive outlook on the company as they are optimistic that recent investments in core food and agro-allied business would propel FMN to deliver optimal returns in the medium-to-long term. “An indication of this is the company’s diversification into food drink production with the introduction of Kool2GO instant powdered drink which is now available for commercial sales. The Kool2GO instant powdered drink comes in sachet size….. This is in addition to the FMN’s snacks and other range of products, like Marios Cheese Balls, Noodies Sweet Snacks and Golden Bites chinchin. In addition, the firm also planned investments in the production and processing of locally grown rice through the participation of local farmers and other stakeholders in the supply chain. The success of these products and investments will boost the overall revenues of the firm and impact on the bottom line in the medium-to-long increase in operating expense depressed operating profit of the company,” they said. The analysts added that operating expenses of the company depressed operating profit. “FMN’s operating expenses (selling, distribution and administrative expenses) increased by 4.34 per cent to N12.83billion from N12.30billion in the corresponding period of the preceding year. As a result, core operating profit declined by 21.41 per cent to N9.49billion, as against N12.1 billion the previous period. The growth in operating expense also impacted the firm’s EBIT which declined by 3.00 per cent N14.32billion in spite of a 80 per cent increase in other income to N4.83billion.. We note that the growth in operating expenses was largely due to investments on selling and distribution during the period as the firm attempt to enhance marketing and distribution efforts so as to drive higher sales volume. Consequently, operating margin fell to 3.90 per cent from 5.03 per cent in the same period of previous financial year. The increase in operating expenses coupled with a corresponding increase in COS, resulted in total cost/revenue ratio of 96.12 per cent, which is higher than 94.97 per cent recorded in the previous financial year. This implies that, in generating unit of sales revenue in the review period, FMN incurred additional expenses,” they said. FMN finance charges accelerated by 45.10 per cent N15.34billion, as the firm’s gross debt increased by 26.34 per cent to N192.00billion, from N152 billion. “We note, however, that the firm’s investments in agro-allied and core food businesses led to increase in borrowings and consequently to high interest expense. In response to the acceleration in finance charges, profit before and after tax fell below expectations. Specifically, FMN’s profit before tax fell 55.73 per cent to N3.70billion, from N8.35 billion, with a corresponding decline in pre-tax margin to 1.51 per cent compared with 3.45 per cent in the same period of previous financial year. In addition, in spite of an 83.40 per cent decrease in income tax provision, post-tax profit contracted by 44.46 per cent to N3.30billion from N5.93billion in the prior year. Consequently, post-tax profit margin fell to 1.35 per cent from 2.47 per cent recorded in the prior year,” the analysts said. The increase in debt has led to an increase in debt-to-equity ratio from 1.82x to 2.40x indicating growing balance sheet leverage. In addition, debt-to-assets ratio increased marginally to 0.59x from 0.51x in 2014. “This implies that the company financed 59 per cent of its assets with debt. The debt-to-assets ratio is high but still within acceptable levels. In addition, assets-to-liabilities ratio, another measure of solvency, came in at 1.33x from 1.39x in 2014. The ratio remains at a moderate level in our view and suggests that the firm’s assets can sufficiently cover its total liabilities in the medium-to-long term if effectively utilized. The moderate debt/assets ratio led us to the conclusion that the firm has a moderate risk profile but can repay its long term loans, interests and meet other financial obligations,” they said. Manufacturing is vital for Muyang’s Flawless Project Delivery (FPD) in providing quality machines and equipment. The manufacture team of FAMSUN Feedmill Solution since moving into the new, state-of-the-art facility in May 2013 has continuously updated their knowledge, skill and standards in machine manufacturing and new tools using, and has made great achievements in the past one and a half years. By cooperating with leading manufacturing tool companies, FAMSUN introduces advanced production technologies such as CNC machining centers, welding robots, chain assembly systems, lean manufacturing management, etc. in its workshops, to produce extra precision and high quality for every piece of FAMSUN product from material processing to machining, painting and assembly. 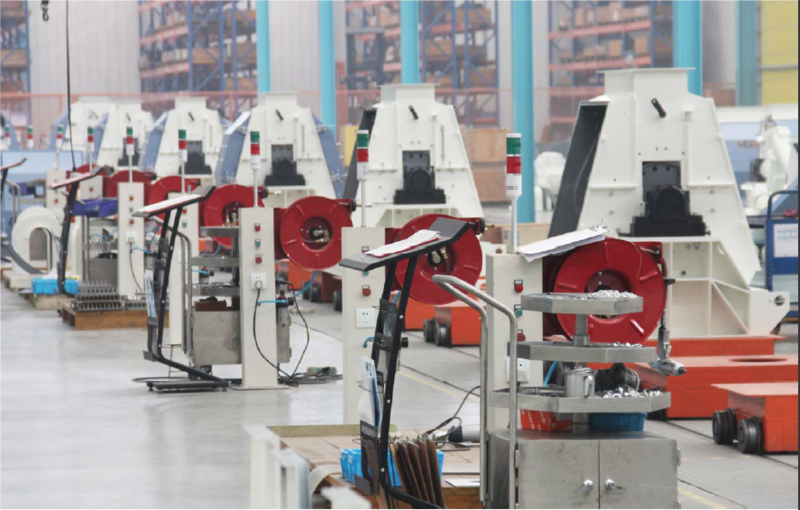 The manufacturing unit also owns the first grinder assembly line in the industry. It has now been able to produce all machines, spare parts, and pre-fabricated parts for various kinds of feed mills’ production demands. Since moving to the new industrial park, FAMSUN manufacturing team has been endeavoring to improve the efficiency of the production lines and the quality of the products. The on-time delivery of machine exceeded 99% in 2014 and products accepted by Quality Control (QC) Department are at nearly 100%. improving suggestions. In carrying out this plan, the team has successfully applied a national patent — Automatic Assembly Device. Through these measures, the product quality has been improved and customer’s satisfaction has been raised. and suppliers’ stuff ensures Muyang to keep growing with a good team by creating quality products and satisfied customers. CHICAGO, IL — Modern Process Equipment Corporation (MPE) features its Chain-Vey® tubular drag conveyor exclusively designed for the superior transport of pet food products. From raw ingredients to finished, ready-to-package goods, the MPE Chain-Vey® offers the most gentle and energy efficient transportation for all phases of your production process. Its flexible design and compact footprint is sure to fit virtually any facility configuration. With a dust-tight enclosed design, you can be certain your pet food is protected from the surrounding environment. The MPE Chain-Vey® also features clean-in-place capabilities with automated wash cycles for sanitary conveying needs. Better pet food requires a better conveying solution. 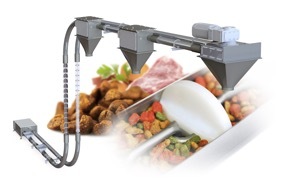 Better pet food requires the MPE Chain-Vey®. For more information, please visit www.chainvey.com or contact MPE directly at solution@mpechicago.com. Modern Process Equipment Corp. (MPE) is the world’s leading manufacturer of precision particle reduction equipment. MPE has been supplying its customers with superior particle size reduction solutions for over fifty years, earning the reputation as the place to go to improve product yields and reduce the generation of unwanted fines. MPE aspires to design and manufacture the most modern, innovative and highest quality equipment with the most responsive, practical and timely service possible. For more information about MPE’s complete line of equipment, contact Modern Process Equipment, Inc. 3125 South Kolin Avenue, Chicago, IL 60623; call +1 773-254-3929; visit www.mpechicago.com. 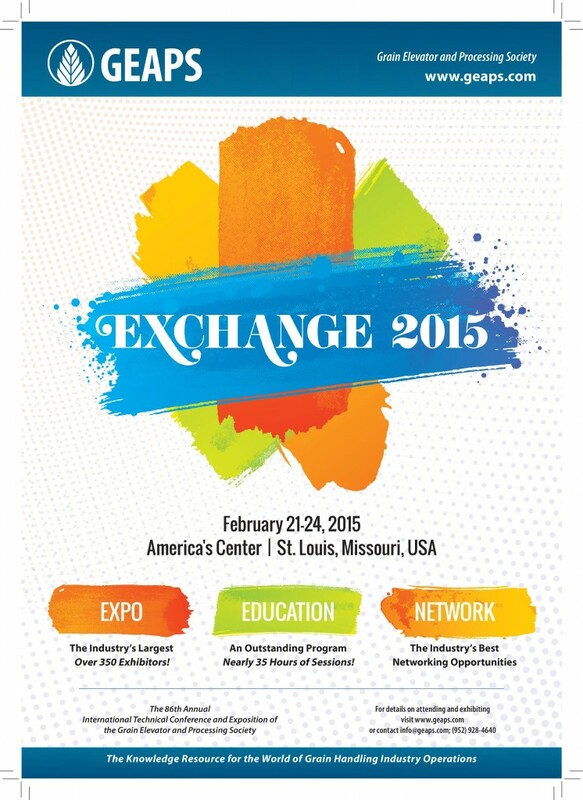 The International Milling Directory is proud to be a media partner and exhibitor again at GEAPS Exchange 2015. Taking place in St. Louis, it is sure to be a great event in the heart of the mid-western region. International Milling Directory members such as Bühler Inc, MFS, 4B, Tapco, The Mathews Company, Seedburo, Brock, Chief Agri Industries and many more. The February issue of Milling and Grain will include a GEAPS preview, with exclusive exhibitor products and more to help you at the event. Pass by our stand to find Mark, Martha, Darren and Tom at the event. Perendale is an official agent of the Rice Milling Expo 2015. The complete solution provider for rice milling machinery, Muyang, extend their invitation to welcome you to their stand next month at the Expo. More details below. Muyang Group China cordially invites you to visit its stall no. 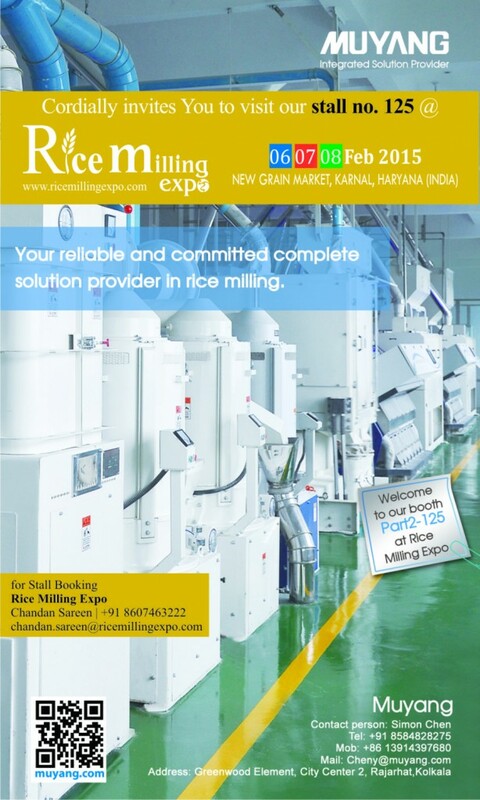 125 at Rice Milling Expo – India’s Largest Technology Oriented International Expo & Conference on Rice Milling Industry scheduled from 6th to 8th February 2015 at New Grain Market, Karnal, Haryana, India.